INVITATION is the first book in the bestselling Kepler62-series. It is also an invitation to readers to join an adventure that is out of this world – most literally! Overpopulation has caused a dramatic decline in Earth’s natural resources and people are struggling to survive. 13-year-old Ari is at home looking after his little brother Jon as their mother is on one of her extended stays away, looking for work, food, hope. Everyone is talking about a new game, Kepler62, that is rumoured to offer something extra for those who manage to clear all the levels. Ari’s attempt to nick one from the shop has been a total failure but to his surprise Jon has been given one! And by a total stranger! The game proves to be difficult, more so than they originally thought. Ari and Jon play together, day and night, united in their quest to learn if Kepler62 is more than just a game. The bestselling authors from Norway and Finland; Bjørn Sortland and Timo Parvela, got together with the inventive and talented Illustrator Pasi Pitkänen, and united their remarkable skills to create the Kepler62 series. This breath-taking adventure spans over six titles in Season1, to tests friendship, brotherhood, and courage in the unexplored reaches of the outer space. 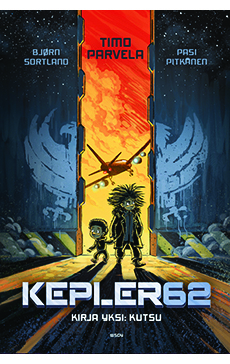 Kepler62 has been published simultaneously in Finland and Norway, and is already reaching children in all corners of the world as rights have been sold to 15 languages to date. TWO TRIBES kicked off the Season 2 of Kepler62 The New World in 2018. Book 2 THE ISLAND and Book 3 THE WHISPERERS’ LAIR will be published in 2019.